Getting chosen by a prospective birthmom is hard work. It takes persistence, creativity, and a bit of luck. More times than not, there’s no good reason why you haven’t been picked. It could be because your adoption letter hasn’t been out there long enough to make an impression. Or because the right prospective birthmom hasn’t come along and noticed it. And yet when things don’t go our way, we’re quick to come up with reasons — excuses, really — to explain what’s happening (or, in this case, not happening). 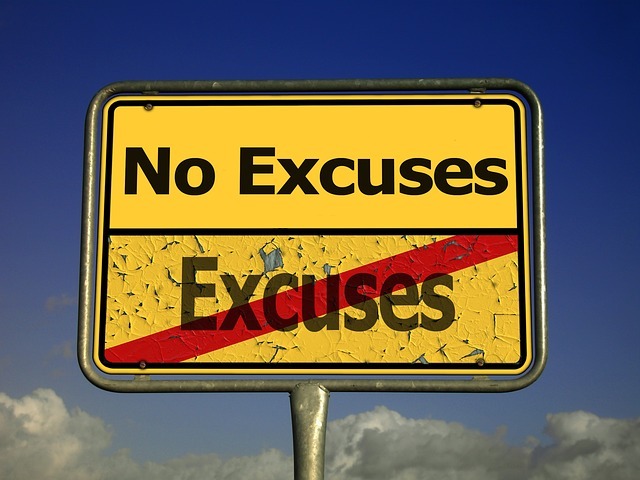 Excuses can be useful in the short run in giving you peace of mind, but they won’t do anything for you down the road. If anything, they’ll slow you down and hold you back from finding a match. Here are some of the more common excuses that hopeful adoptive parents tell themselves when their efforts to connect with a prospective birthmom don’t get the results they were expecting. 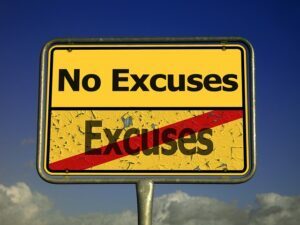 Got an excuse that isn’t on our list? Feel free to share it in the comments section. Says who? Infertity hurts, but it doesn’t mean you can’t be a mother. There’s only person who can stop you from adopting: you. With a positive attitude and a proactive approach, you can reach out and eventually connect with a prospective birthmother. Thousands of other other women have triumphed over infertility (and worse) and gone on to become amazing mothers. You can too. Your adoption profile is your calling card to prospective birthmothers, the first thing they see when they’re looking for an adoptive family for their baby. So if you feel yours isn’t up to scratch, there’s only one thing to do: fix it. Sitting around and complaining about it, or comparing it to others, won’t make it better. Having a website is a great way to take your adoption marketing campaign to another level and get the word out about your plan to adopt. But it isn’t the deciding factor. Until a few years ago, nobody had a website and it didn’t stop them from adopting. So if you really think it’s holdng you back, go out and get one. Creating one today is easier and cheaper than ever before, and if it works or just puts your mind to rest, it will be worth every minute and penny you spend on it. Adoption isn’t for the faint of heart. Or for the young. By the time most couples start contemplating it, they’re already in their mid- to late-30s. Some are even older. But rather than look at your age as a liability, consider it an asset. It just means you’ve been around the block a few more times and have more life experiences and wisdom to show for it. At least that’s what we told ourselves when our younger son’s birthmom chose us when we were well into our 40s. Birthmothers choose adoptive parents because they can relate to them, not because they’re beautiful. Adoption isn’t a beauty contest. It isn’t any kind of competition at all. Birthmothers aren’t looking for perfection. They’re looking for a family that will provide a loving home for their baby. The fact that you’re overweight (or whatever it is about yourself that you don’t like) doesn’t make you any less appealing. It makes you more human. And whether you’re a prospective birthmom or not, that’s something we can all relate to. Waiting to get chosen by a prospective birthmom can sometimes feel like you’re back in sixth grade, waiting to get picked for the basketball team. It’s true: Not everyone will get chosen. But whether it means spending a bit more time working on your parent profile to getting help with your marketing campaign, there are many things you can do that will give you the edge and increase your odds of getting noticed by an expectant mother. Where you live is important for some prospective birthmothers in an open adoption, especially if they plan to visit but don’t have a budget to do it. But for others, your location doesn’t matter. Big city, small city, house or condo — it’s all the same to them. What’s important is that they feel respected and comfortable around you wherever you call home. 8. Why would anyone pick me? Going through infertilty can wear you down. It can make you feel like you’re unworthy of anything, never mind becoming a parent through open adoption. “There are so many more deserving people than me.” “I haven’t done anything to earn this.” “My life is pretty boring compared to other people.” But that’s the wrong way to look at it. Everyone has something to offer. The key is to find out what is and to leverage it in order to stand out from other hopeful adoptive parents. Celebrity adoptions are all the rage. But they’re the exception, not the rule. Most adoptions today aren’t by Brangelina or Meg Ryan or Sandra Bullock. They’re by every day ordinary people just like you and me. (I don’t know about you, but I don’t mind being described as “ordinary.” There are a lot of worse things you could be called.) Being a celebrity would be nice for many reasons. (Who wouldn’t want to get their hands on a great swag bag or date somebody famous?) But thankfully, you don’t need to be one for a prospective birthmother to choose you. You just need to be yourself. Nobody does before they have a child. Even people with children are often clueless about what to do. Parenting is hard work, and it’s a work in progress. It has its share of ups and downs, and involves a lot of trial and error. But the fact that you have a passion for it — that you want to become a parent more than anything else in the world and taken all kinds of education classes to learn how to do it — gives you a leg up on other people. Plus, it will prepare you for many of the challenges ahead. And trust me, there will be lots of those, in addition to the many joys. When you’re trying to build a family through open adoption, there’s nothing better than being contacted by a prospective birthmother. Or more nerve-wracking. What do you say? What if she asks a question you can’t answer? With so much at stake, that first conversation can be terrifying. The good news is that there are ways to prepare yourself and make the most of it. Plus, don’t kid yourself — she’ll be on pins and needles, too. See, you already have something in common! So don’t be so hard on yourself. Just relax and take it one step at a time. It will go by faster and easier than you think! Finding excuses about why you haven’t been chosen by a prospective is something that all hopeful adoptive parents do while they’re waiting to adopt. But it doesn’t make things easier or the time go any faster. To be successful, you need to identify what’s holding you back and take whatever steps you need to take to move forward and find the match that’s meant for you. What excuses are stopping you from getting chosen by a prospective birthmom? What helped you to deal with them? Share your comments here or on our Facebook page.